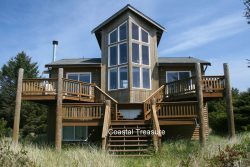 Cozy up in this lovely three story in Ocean City just 7 miles north of Ocean Shores, hand-crafted home with many architectural delights. Enjoy the native decor and carvings, log bed, and stained glass windows. There are 2 bedrooms, one with a queen bed and one with a full bed, an open loft with a queen bed and a family room with two twin beds. There are two full baths, one with a jetted Jacuzzi tub and a half bath. The living room, kitchen and dining area, and the loft bedroom all have an ocean view. You can sit around the fire in the evening and enjoy a sunset. All homes do require the first night plus tax for deposit. This deposit is non-refundable. If you cancel, this deposit IS NOT returned. There is a 2 night minimum stay, 3 nights during the holidays. All homes have a cleaning fee. There is a 3 car limit at this home. You must be at least 25 yrs. old to rent one of our properties. Smoking is strictly prohibited. Two small dogs are okay with a additional charge. Extremely responsive team. Very helpful with issues that arose, even very late at night. One of the most lovely vacation properties Ive stayed in. All aspects of the experience were positive. We are long time customers of at the beach rentals inc. for big reason.We have always been pleased with the rental and the service. As always the house was clean from the bottom to the top floor. No musty smells like you get in some rentals "when you rent some were else." Every thing was in working order as for Kitchen/entertainment/washer and dryer/dish washer. All the comforts of home but no more than a 5min. walk from the beach. Great view what else can you ask for. Oh I know some might want WI-FI. No worries the house has it. Play movies right to the TV from you mobile device. Not a need for us but nice to have. Thank you for a great 10day stay. Ray and Barbara. Tammy is always there greeting you with her sweet smile...never had a problem checking in...checking out...making reservations. We loved this house! The location was quiet, private, and easy to find. All the little details really jumped out at us, made it fun yet comfortable. The view is amazing! The walk to the beach looked kind of far from the dining room view, but was actually very quick, easy, and enjoyable. Overall I felt that I should live there! Thank you for a great experience and look forward to staying there again. Both Tammy whom I've worked with for several years and Danielle are awesome. They answer all my questions and are timely with getting everything I need back to me. I have used your company for easily over 10 years and would highly recommend you to anyone. The staff is awesome. We are 10 year customers and the staff have always went out of there way to make out stays amazing. Tammy, Dainelle and Rick our stay in 7/2017 was great as always. Thank you for helping us find another great vacation house. The team was friendly and knowledgeable about the house we rented. Absolutely beautiful!! This was an amazing house with spectacular views! We definetly plan on returning! !